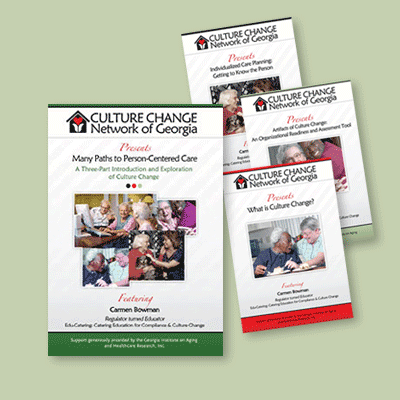 This three-part training series introduces the concepts and practices of culture change for settings that service older adults. 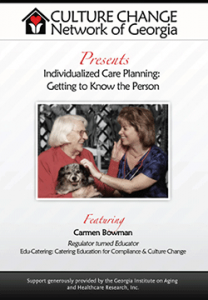 Presenter Carmen Bowman is a nationally recognized culture change educator who vividly illustrates the meaning, implementation, and impact of culture change principles in care settings ranging from adult day services to assisted living to skilled nursing care. 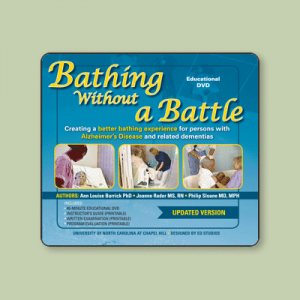 An accompanying CD-ROM contains lecture handouts and recommended resource materials. Introducing the national culture change movement and the Pioneer Network that spearheaded it, this training session describes culture change models including the Eden Alternative, the Regenerative Community, Bathing Without a Battle, and the Neighborhood, Household and Green House models. 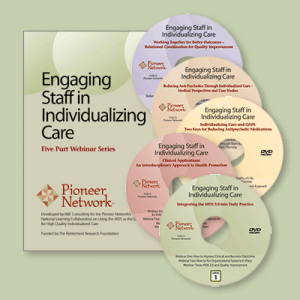 Outcomes from leading Pioneer homes illustrate how to change the institutional culture without spending money. 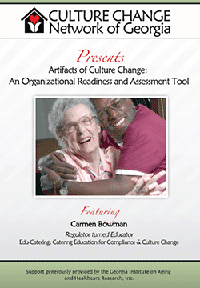 Learn how to use the Artifacts of Culture Change measurement tool to identify and document the concrete changes made within your organization in your efforts to create a homier environment and practices that improve the lives of elders in your care. In reviewing the 78 improvement points in the Artifacts Tool, learn about culture change practices you may not have considered in your efforts to shift from institutional to individualized care. Carmen Bowman, MHS was a Colorado state surveyor for nine years, surveying nursing homes, assisted living residences, and adult day programs. She was a policy analyst with CMS where she taught the national CMS Basic Surveyor Training Course. 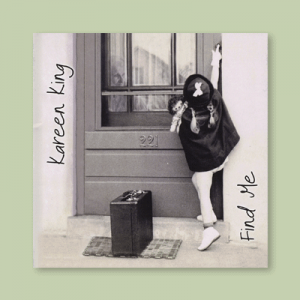 She now works as a contractor to CMS, and co-developed the Artifacts of Culture Change tool. Carmen facilitated the Creating Home national symposium in 2008, which explored the environmental requirements and Culture Change. 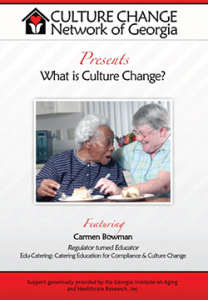 She is the owner of Edu-Catering: Catering Education for Compliance and Culture Change in long-term care, which provides Culture Change consultation. Carmen is a nationally-recognized expert in Culture Change and is a frequently invited speaker at national industry conferences.